A new study has found that large comets and asteroids bombarded Mars some 4 billion years ago and may be responsible for enhancing the climate conditions that made the red planet more conductive to life, at least for a time. A new study has found that large comets and asteroids bombarded Mars some 4 billion years ago and may be responsible for enhancing the climate conditions that made the red planet more conductive to life, at least for a time. If early Mars was as barren and cold as it is today, massive asteroid and comet impacts would have produced enough heat to melt subsurface ice, said Stephen Mojzsis, a professor at University of Colorado Boulder in US. Scientists have long known there was once running water on Mars, as evidenced by ancient river valleys, deltas and parts of lake beds, said Mojzsis. In addition to producing hydrothermal regions in portions of Mars’ fractured and melted crust, a massive impact could have temporarily increased the planet’s atmospheric pressure, periodically heating Mars up enough to “re-start” a dormant water cycle. 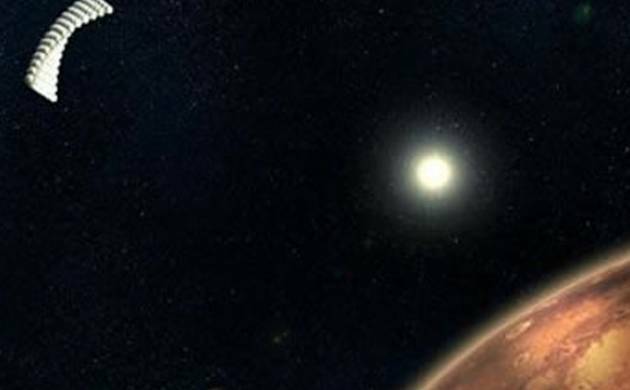 “This study shows the ancient bombardment of Mars by comets and asteroids would have been greatly beneficial to life there, if life was present,” said Mojzsis. “But up to now we have no convincing evidence life ever existed there, so we don’t know if early Mars was a crucible of life or a haven for life,” he said. Much of the action on Mars occurred during a period known as the Late Heavy Bombardment about 3.9 billion years ago when the developing solar system was a shooting gallery of comets, asteroids, moons and planets. Unlike Earth, which has been “resurfaced” time and again by erosion and plate tectonics, heavy cratering is still evident on Mercury, Earth’s moon and Mars, Mojzsis said. The study showed the heating of ancient Mars caused by individual asteroid collisions would likely have lasted only a few million years before the red planet - about one and one-half times the distance to the Sun than Earth - defaulted to today’s cold and inhospitable conditions. “None of the models we ran could keep Mars consistently warm over long periods,” said Mojzsis. While Mars is believed to have spent most of its history in a cold state, Earth was likely habitable over almost its entire existence. An earlier study showed that the Late Heavy Bombardment period in the inner solar system nearly 4 billion years ago did not have the firepower to extinguish potential early life on Earth and may have even given it a boost if it was present. The study was published in the journal Earth and Planetary Science Letters.